The Chuang LI is COES's latest flagship offshore heavy lift vessel and is due to enter commercial operations early in 2019. China Ocean Engineering Shanghai Co (COES) has invested around half a million pounds in establishing its new renewables and decommissioning focused offshoot, COES Caledonia (UK) Ltd, in the city. It is a further boost to Dundee’s offshore aspirations, which are being built out through the Dundeecom banner in partnership with docks owner Forth Ports, the city council and the private sector. 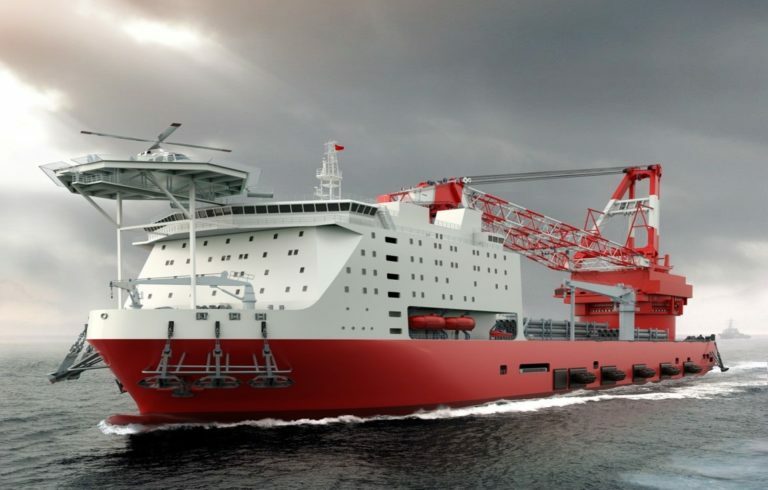 Last month, Offshore Decommissioning Services revealed plans to base its operations, engineering and logistics base in the city in support of Moonraker, the offshore heavy lift vessel it plans to build. COES is significantly further down that road with its latest £400 million heavy lift flagship – the Chuang Li – in final commissioning ahead of entering commercial operations early in the New Year. The new COES Caledonia office is planning to offer the 4,500MT Chuang Li for heavy lift operations in the North Sea. The plan – and the build-out of the firm’s local operations from an initial staffing base of up to 15 – is dependent on contract wins but COES Caledonia director general, Professor Norman McLennan, said he was confident there was a bright future ahead. The intention to build a major business in the city is underscored by the fact COES International President, Mr Hong Chong, has travelled from China to Dundee to attend the official opening of the local office, which will be based at River Court, Dundee One at the city’s waterfront. “COES is part of the Ministry of Transport in China. It is a state-owned and because of that is financially stable,” Prof McLennan, an oil and gas industry veteran who was raised in Dundee and educated at Harris Academy, said. The investment in Dundee follows a meeting between Mr Hong and Scotland’s First Minister Nicola Sturgeon during a trade mission to China in the Spring. Business, Fair Work and Skills minister Jamie Hepburn will attend the official office opening in Dundee today along with local dignitaries and members of the business community. Prof McLennan said the capability of the Chuang Li – which literally translates as innovative vessel – was a potential game changer for the North Sea decom sector and the emerging offshore renewables industry. He said it had the capability of removing entire platforms topsides and subsea jacket infrastructure in single lift operations and could also handle the removal of abandoned seafloor pipework. The Chuang Li will also be able to assist in renewables operations – a capability that will be required as three multi-billion pound offshore wind farms planned for the Outer Firths of Tay and Forth – NNG, Inch Cape and Seagreen – are built out in the years ahead. “The office initially will be a small presence with up to 15 people,” Prof McLennan said. The international spotlight fell on COES last year after it successfully completed the raising of the MV Sewol ferry off the coast of South Korea. The stricken vessel had lain for almost three years following its tragic sinking in 2014 in which more than 300 passengers died, the majority of them schoolchildren. The operation was one of the largest sea born salvage projects ever undertaken. COES completed the project by strapping steel wires around the wreckage and raising it in the space between two floating barges. The lift was completed in a day and the Sewol was later brought ashore for salvage and further investigations.